Anywhere, anytime learning that digital and media literacies support is now a fundamental human right that calls for equal access by all. Yet the gap between today’s world of education and that of an interconnected world dependent upon quick and ready access to media and information – and the ability to discern and act responsibly -- is far apart. Societies are more reliant than ever upon human capital that can contribute to success and sustainability. Yet policies – and the research that informs them – are widening digital and media literacy gaps rather than narrowing them. To inform policy, longitudinal studies that identify the essential knowledge and skills are needed to foster digital and media literacy competencies for lifelong learners. These studies also need to identify pedagogies that emphasize closing a digital use divide that often holds lower-income communities back from full participation in civic and economic life. Furthermore, research must address the fact that learning happens outside classrooms as well as inside, especially through technology, and that all learning opportunities should be used and leveraged to develop human potential. Educators must be prepared to engage in the practices that have the most impact in a digital age. In the meanwhile, policy makers need not wait: immediate actions can be taken, such as eliminating high stakes testing that contribute directly to rigid and outdated structures of schooling. Furthermore, local officials should be empowered to make decisions about instruction and assessment in schools so that their decisions are informed and appropriate for their communities. Funding structures must change to support research and development and to meet local needs, rewarding innovation and results rather than seat time. Finally, the legal framework governing intellectual property must be challenged and changed, to support the use of adapted and transformative texts that permit the development, recreation and sharing of digital assets. What specific competencies must young citizens acquire, and how do these competencies affect pedagogy? Young citizens must be equipped to learn anywhere, anytime so that they are able to responsibly and critically consume and create digital, multimodal texts. Rather than pedagogy being centered on the transmission of content knowledge through direct instruction by teachers, it must instead focus on empowering youth to navigate and participate in interconnected, often virtual spaces where they learn to contextualize, acquire, and apply content knowledge. These competencies require a more complex application of skills than traditional print-based literacy. 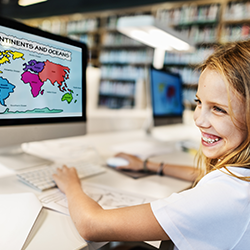 How are student knowledge, attitudes and behaviors changed through digital and media literacy? Digital and media literacies take into account the full range of literacy skills needed to read, write, speak, view and participate in society. Research shows that digital and media literacy equip youth to critically navigate their digital lives and have positive impacts, as well as mitigate potentially harmful effects of participation in digital spaces. An extensive meta-analytic review found that these interventions counteract effects related to risky and anti-social behaviors, including violence and aggression, alcohol and tobacco use, body image, eating disorders and commercialism. Other studies show increased civic responsibility and democratic participation. What are the best ways to assess students’ digital and media literacy? High stakes tests that define literacy and curriculum too narrowly, and contribute to rigid, outdated structures of schooling should be dismantled and replaced by structures that build and reinforce digital and media literacies. Such new structures provide for variability in context and community needs that one-size-fits-all approaches cannot. Funding mechanisms must also change to accommodate new structures for supporting literacy for a digital age. We must close the gap between real-world, interconnected learning and the formal structures of school so that children are prepared for lifelong learning and equipped with the skills they need to access, analyze, evaluate, create and participate in society through digital technologies. We must invest in the literacy practices of our youth to create the human capital necessary for success and sustainability in a technology-driven world. Research and policy actions that support digital and media literacy are imperative; we need to move quickly to address outdated modes of assessment, individualized learning (rather than one-size-fits-all), and new intellectual property frameworks appropriate to education in a digital age; and research needs to provide insight into: identifying the knowledge and skills called for with digital and media literacy; closing the digital use divide; and investigating connections between in-school and out-of-school learning and civic engagement.